If you want to take in some mountain scenery in Kyoto, the Eizan Electric Railway (sometimes also called Eiden) is your best choice. Eizan trains run from Demachiyanagi Station to the northern parts of Kyoto. 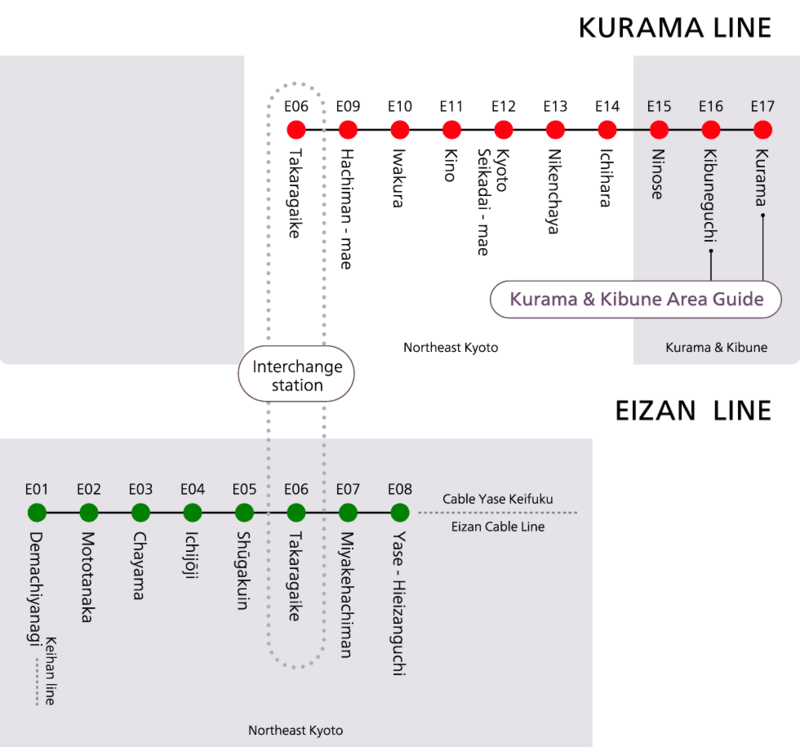 The line splits at Takaragaike Station (E06), so be careful when choosing your train. 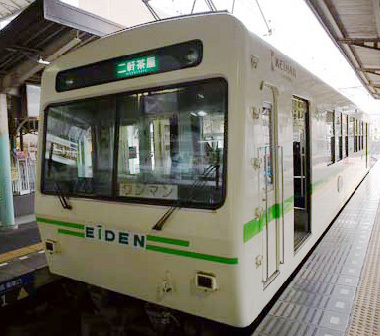 The Eizan Line ends at Yase Hieizanguchi Station, where you can transfer to the Eizan Cable Car to visit Mount Hiei. The Kurama Line heads to Kibune Village and Mount Kurama, the home of Kifune Shrine and Kurama-dera Temple, and features a famous tunnel of maple trees. As with other means of public transportation in Kyoto, using an IC card is the most convenient option. If you do not have one, at major stations you have to purchase your tickets at the ticket vending machines before entering the gate. You may wish to pay the return fare in advance for convenience. However, at smaller stations there may be no ticket machines available. If so, you can board the train and pay cash at your destination upon arrival. Before boarding, check your fare on the Eizan Railway fare table on the platform. The black numbers show the fare for adults and the red numbers for children. The Kansai Thru Pass can be used with the card reader on the fare machines inside the train cars or at station gates. Choose the ticket type (one-way or return fare) and the number of passengers. You can buy as many tickets as you need to at the same time if you are traveling in a group. Take the ticket and go through the gate into the station. Enter the platform by inserting your ticket into the slot on the right side of the ticket gate. Take your ticket after you pass the gate. Please enter the train from the doors at the rear of the car. Some stations have no gates or ticket machines. In this case, pick up a station slip (proof of boarding ticket) from the machine on the platform and board the train. If you are using an IC card, touch it to the card reader installed on the platform before getting on the train. Insert your ticket or fare (including the station slip) into the machine by the exit at the front of the car, or touch your IC card to the card reader, then exit the train. Get off the train and head towards the ticket gate. Insert your ticket into the machine or touch your IC card to the card reader and exit. If you do not have a ticket, go to the manned exit and make your payment in cash based on your station slip.